Just a short 30 minute drive or train ride from Boston, a Concord River rafting trip is a great one-day adventure and a quick weekend escape. A unique urban whitewater rafting experience, the Concord River flows right through the middle of Lowell, Massachusetts, and ends in a lock chamber from the 1850’s! Rafting trips float through the Concord River Greenway, a green space preserved in the town of Lowell that is home to many types of wildlife including mergansers, hawks, foxes, and otters. Zoar Outdoor– Offering a wide range of outdoor activities, Zoar Outdoor has been a leader in the industry since 1989. Zoar Outdoor promotes self-propelled, low-impact, wilderness recreation in the Northeast. Zoar offers whitewater rafting trips on the Concord, Millers, and Deerfield Rivers in Massachussets, and the West River in Vermont. 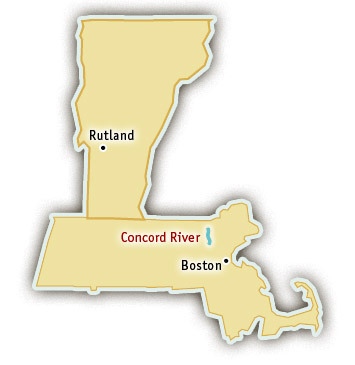 Visit their website for more information about Concord River Rafting. Bouncy wave trains and technical drops make the Concord River a real crowd pleaser. In a short, one-mile stretch, the Concord River flows over three waterfall-type rapids: Middlesex Dam, Three Beauties, and Twisted Sister. All of these rapids require hard paddling and are sure to provide big splashes and a rush of adrenaline. Because of the length of Concord River rafting trips, and the easy shuttle, rafters have the opportunity to run the stretch twice in one day. Running the same stretch twice doubles the chances of whitewater excitement and allows time to get to know the Concord River canyon a little better. 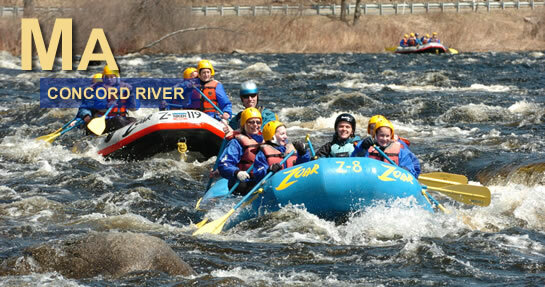 Concord River rafting trips are offered in the spring months. Flows and the length of the season depend on snowmelt and spring rains.